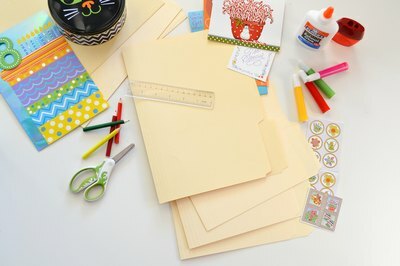 Decorating plain file folders is an easy, inexpensive way to brighten up your office workspace or homework desk. Make themed folders for your classes, committees or outside organizations. Use bright geometric patterns to decorate folders to brighten up your office cubicle. Personalize a folder for each member of your family to keep all party invitations, notes of appointments, mail or important papers organized at home. Children who enjoy playing office or school may also enjoy decorating folders for their playroom. Make pretty home office folders with patterned wrapping papers or wallpaper remnants. Make a set of decorated folders for your classes at school to contain the papers for each subject. Using markers, color bright mathematical symbols and numerals on your math folder. Design a book cover on the front of your literature class folder. For geography or foreign language class, glue cut-out pictures of famous world landmarks or pieces of old maps onto the folder. Decorate your music folder with stickers of music notes and instruments or pictures of your favorite musical artists. Use colored adhesives and shaped stickers make a set of color-coded folders to keep organized at work. Select a different color for each topic -- blue for correspondence, green for calendars and red for invoices, for example. Cut a piece of adhesive tape the same height as the folder. Carefully put the tape strip on the outside center fold line of one folder. 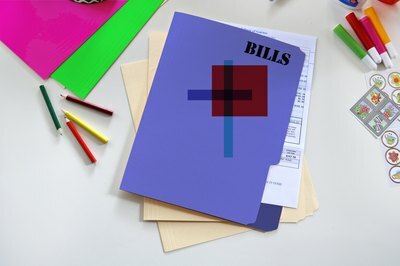 Add different-size strips in the same color in patterns on both sides of the folder. Incorporate a few shaped stickers in that color. Complete with enough additional colors to complete the desired number of folders. Make a personalized folder for each person in your family to keep their items organized on the family desk. Stamp on items symbolic of each person's hobbies, favorite sports team or other defining personal characteristics. 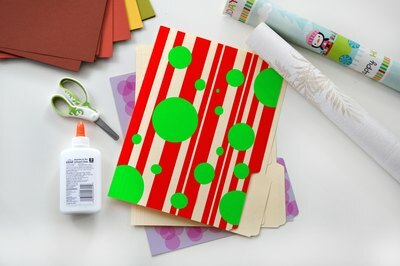 Add splashes of each one's favorite color using markers or stickers. Adhesive letters in fun styles and bright colors lend a finishing touch when used to spell out the family member's first name or nickname on her folder. 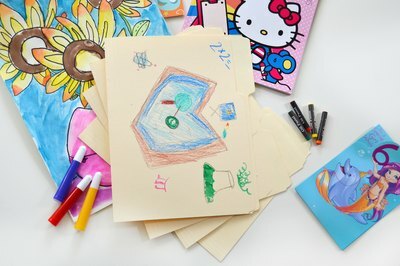 Give your children old folders and crayons or markers to decorate them. 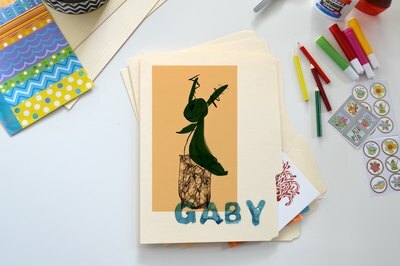 Encourage them to be creative when designing their folders for their pretend office. Let them play teacher and create folders for dolls and stuffed animal students. Cut pieces of patterned wrapping papers; glue the paper to the folders to make a set of attractive home office organizers. You may also use pieces of leftover wallpaper for home office folders.